After a handsome stranger interrupts her secret morning ride, Sadie McEwan knows her heart is in trouble. The man seeks to buy several mares from her father's Spinning Wheel Farm and promises to return in a few months. Could he be interested in claiming more than horses? Harry Cooper longs to court Sadie McEwan. But when he returns to the Shenadoah Valley, he finds Sadie changed. She's reserved and hesitant, and Harry isn't allowed to speak with her father - about business or his daughter's hand. A stolen kiss leads to Sadie's request that he leave. Before he can honor her wish, Harry learns a startling and painful truth - the woman he loves has lied to him. Can Harry forgive Sadie for her deception? Or has the fragile fabric of romance been torn beyond repair? 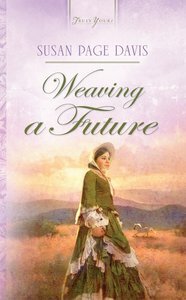 About "Weaving a Future (Virginia Brides #03) (#719 in Heartsong Series)"
Susan Page Davis is the author of more than thirty published novels. She's a Carol Award Winner and a two-time winner of the Inspirational Readers' Choice Award. In 2011, Susan was named Favorite Author of the Year in the 18th Annual Heartsong Awards. A native of Maine, she and her husband, Jim, now live in western Kentucky.